A mashup of Lexus IS and GS components and styling cues, the Lexus RC coupe has developed a small but loyal following since it debuted for the 2015 model year. The RC F is even more specialized, a performance version equipped with a V8 engine and track-ready dynamics. It serves as a halo car for the Lexus F performance brand, and for 2020 it gets a freshening that improves the RC F in subtle but meaningful ways. The Lexus RC is dramatically styled, more so than other Lexus models. In its original iteration, the design didn’t always gel, but updates for the 2019 model year added cohesion the car previously lacked. Now, the RC F gets a similar program of refinement. Don’t worry, it still makes a bold visual statement, but now the stacked LED headlights with integrated Lexus swoosh running lights, minor grille modifications, new taillights, and revised rear bumper grow the car up a bit. Better yet, the updated design improves aerodynamics, especially for the new limited-production Track Edition. This version has carbon fiber aero bits, as well as a carbon fiber roof and hood to eliminate weight and drop the center of gravity a bit. The RC F Track Edition comes only in white or a matte gray color, the latter exclusive to this version of the car. Lexus has not detailed any changes to the RC F’s interior, other than to note that the Track Edition is equipped with red leather, red Alcantara accents throughout, and red carbon trim on the dashboard and doors. Lexus wanted to improve the RC F’s performance for 2020, both by reducing vehicle weight and re-tuning the car’s hardware. It continues to use a normally aspirated 5.0-liter V8 engine, massaged to make 472 horsepower and 395 lb.-ft. of torque (up 5 hp and 6 lb.-ft. from last year). The standard 8-speed automatic transmission gets a higher final drive ratio for better off-the-line response, and a new launch control system debuts as standard equipment. 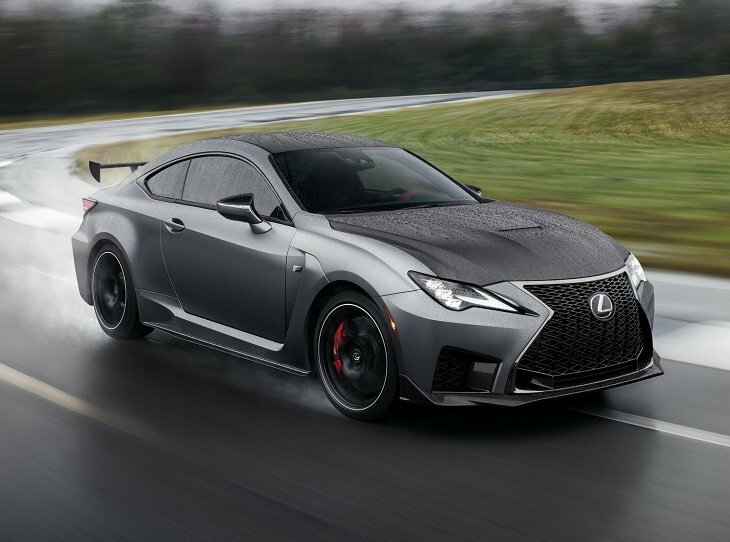 Additionally, Lexus re-tuned the RC F’s suspension, and new Michelin Pilot Sport 4S tires that are made specifically for this car help to reduce understeer, improve lateral grip, and increase durability when the coupe is driven hard. In creating the RC F Track Edition, engineers turned to the expertise of Lexus race teams in the Super GT and IMSA series. Equipped with further aerodynamic enhancements to improve downforce and reduce drag at speed while enhancing steering precision, the Track Edition is fitted with standard Brembo carbon ceramic brake rotors and lightweight 19-inch BBS forged aluminum wheels. Together these components eliminate 55 pounds of unsprung weight. A titanium muffler and exhaust also reduces weight while giving the car a signature sound while it accelerates to 60 mph in less than four seconds, according to Lexus. No changes are made to the RC F’s safety system offerings, which include Lexus Safety System+, a robust collection of driver assistance and collision avoidance technologies. Lexus also supplies a 10-year subscription to Safety Connect service, generously ensuring that features such as automatic collision notification and emergency calling are available to you for a long time. Lexus announced no changes to the RC F in terms of technology, which means it still has its frustrating fingertip touchpad infotainment system interface. Highlights range from a 10.3-inch infotainment display and connected services compatible with Amazon Alexa and smartwatches in addition to smartphones to Mark Levinson premium audio components and, yes, Apple CarPlay. But Android Auto remains missing in action.